Global Teq Training Academy: What/Who makes A Great Black Belt Aspirant? Six Sigma is concerned with more than fact-based, data-driven statistical analysis. This methodology depends on people for its success just as much as it revolves around problem solving tools or quality improvement principles. Six Sigma’s focus on people is illustrated by its belt system. This system, like the belt system in martial arts, ranks Six Sigma professionals based on training, expertise and their degree of experience with Six Sigma methodology. Six Sigma nurtures professionals to advance their belt ranking by acquiring additional training and experience. The typical order is White belts, Yellow belts, Green belts, Black belts and ultimately master black belt and Champion. Six Sigma trainees who rise through the belt rankings usually top out at the level of Green Belt. Employees who reach Green Belt status are typically part-time Six Sigma professionals who must decide if they want to make the commitment to become a Black Belt and practice Six Sigma full time. Zealous black belts must decide if they have the character, skills, qualities and attributes of performing well in this role, leading Six Sigma projects, teaching and mentoring others. 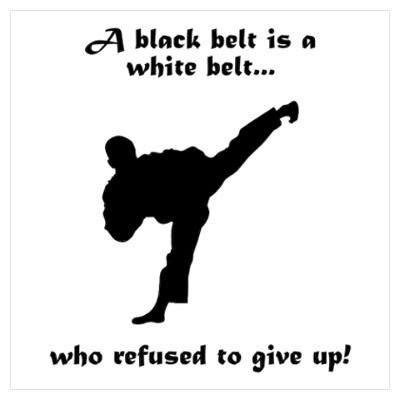 What will make you a Great Black Belt? Training alone does not make a successful Six Sigma Black Belts. Candidates must also possess the leadership, communication and interpersonal skills to thrive in a process improvement environment. 1) Change Agent: Black belts have a good track record of leading change even when it’s not part of their job description. Ideal candidates will have a history of challenging the management hierarchy to implement change. Change agents can cope with the uncertainty they inject into a process and they can deal with employees who are upset by the change they introduce. These candidates also know how to obtain support for the changes they advocate. 2) Leader: Black belts must have leadership qualities and teamwork skills that help the team progress and achieve their goals and objectives. Candidates who understand team dynamics are more likely to get the most from their project teams. Strong interpersonal skills help to influence and motivate team members and keep the team productive. 3) Communicator: Black belts are at the center of the Six Sigma improvement process and are periodically required to communicate up and down the organizations hierarchy. Black belts must be able to speak equally well to C-level executives and front-line workers. Excellent communication skills help them act as trainers, coaches and mentors for their project teams. 4) Business Strategist: Strong black belt candidates pair in-depth understanding of quality improvement with a knowledge of how Six Sigma projects impact business operations. The ability to explain how Six Sigma initiatives create a competitive advantage and improve financial performance is vital for aspiring black belts. 5) Passionate Advocate: Black belts with a passion for Six Sigma are far more effective at motivating their teams when encountering resistance or after hitting a plateau. Black belts capable of injecting their passion for Six Sigma into the teams they lead will typically get much better results.